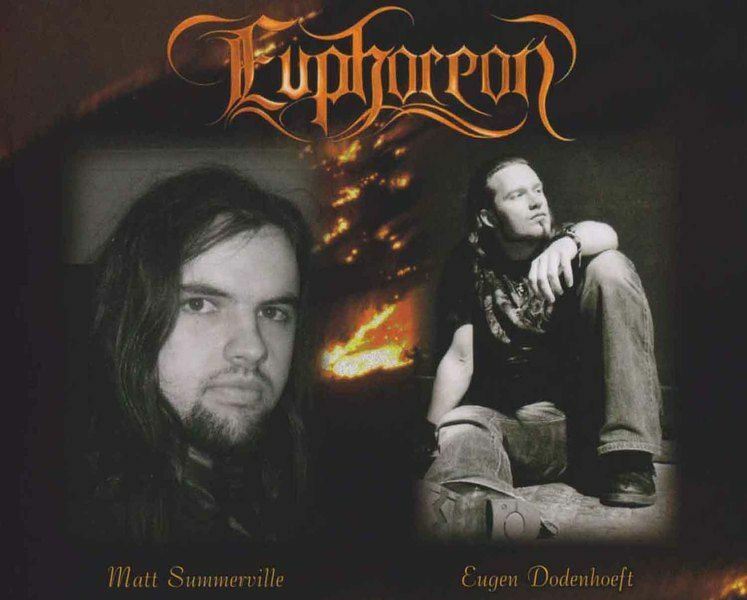 Euphoreon is a German/New Zealand metal band, originally formed as a solo project band by Matt Summerville from New Zealand in 2009. 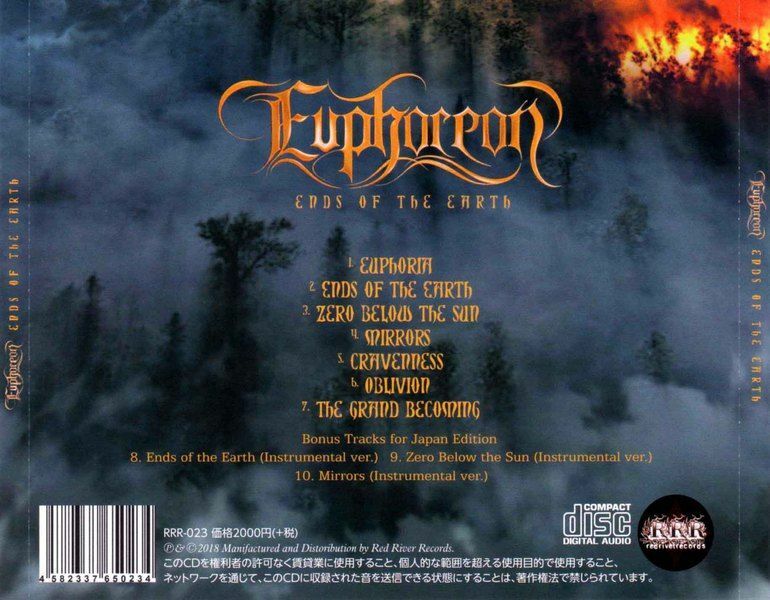 Musically, Euphoreon has strong Scandinavian and European melodic metal influences, combining predominantly harsh vocals with strong melodic hooks.A home demo called 'Before The Blackened Sky' followed soon after in March of 2009, gaining positive feedback from the community. Matt continued to write songs with the hope of finding someone to produce a full-length album. 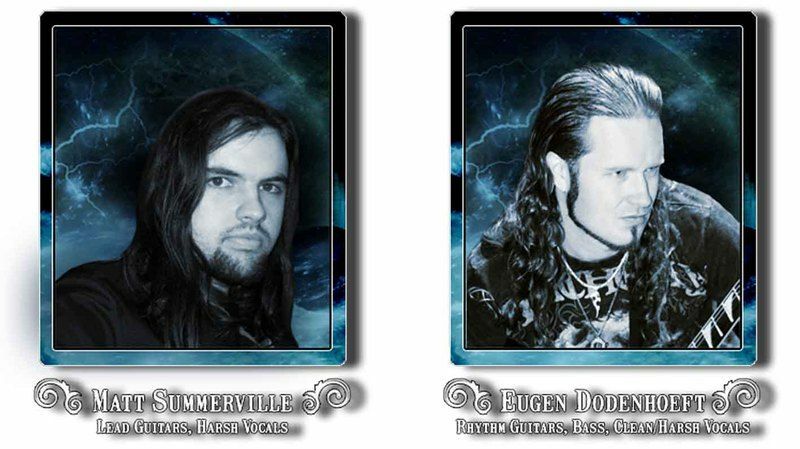 In November 2009 he, by chance (or fate) came across the very man for the job.Eugen Dodenhoeft from Far Beyond, Germany, joined the project as producer, guitarist, and second vocalist - in the process giving Euphoreon new depth and professionalism to move forward. Hard work followed over the next year, writing and recording the first full-length and self-titled album, overcoming a lot of obstacles and taking Euphoreon to the next level. Also lending his playing to the album was Patrick Stäudle, on Piano.The debut Album 'Euphoreon' was released on the 30th of April 2011. It can be downloaded on iTunes, Amazon and Bandcamp. Physical Digipaks can be ordered via Bandcamp. All it took to interest me in Euphoreon was an offhand comment about how they sound like "Wintersun if they were actually good". My boundless hatred for Wintersun has become something of a claim to fame for myself, but I've always vocally given credit where credit is due, and readily admit that they have a few incredible songs and could genuinely be an amazing band if they consistently played to their strengths instead of bloated everything to death. If anybody else is touted to be exactly what it is I truly want out of my arch nemesis, then of course I'm willing to give them a shot.Euphoreon... well isn't quite that, because their influences are definitely more varied than that one particular Finnish institution, but they're solid regardless.Ends of the Earth doesn't really break any new ground but they play this distinctly European style of melodeath pretty well. Instead of really aping Wintersun's sound like I keep reading about, more accurately they sound like something of a hybrid between the less insane non-Bodom Bodom clones that started gaining traction shortly after they rose to prominence (like Skyfire and Kalmah) and the more melancholic and riffless style of melodeath that Insomnium helped popularize. I guess you could argue that this really isn't so different from something like Frosttide but the first thing I thought when giving this album its first spin was how much it made me want to listen to Be'lakor. I haven't seen them namedropped much around the band, but most of these melodies that carry the songs are straight out of Stone's Reach or Of Breath and Bone. Hell, "Euphoria" almost uses the exact same main theme as "Abeyance" note-for-note. That style of melody where the guitar quickly palm mutes an open high string and intermittently baps a few notes up the neck is abused to no end here. 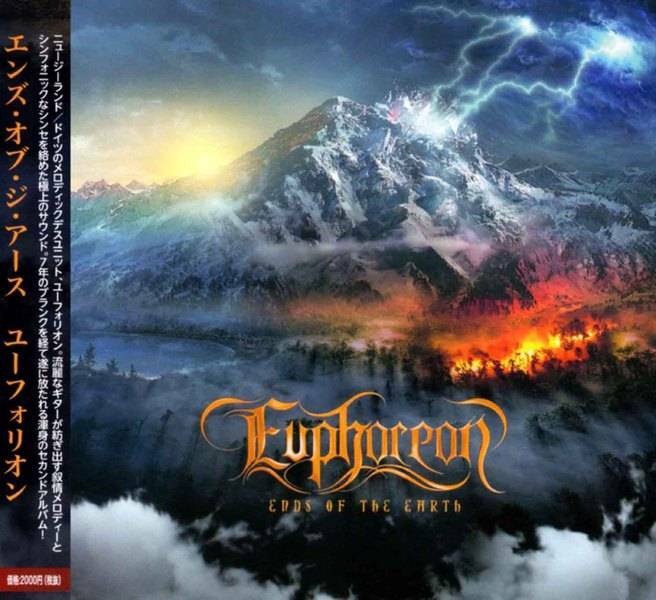 The addition of epic keys and choirs is the one thing that truly sets Euphoreon apart from the style they're so firmly rooted in, and it's likely why they're more immediately compared to what seems to actually be their secondary influence. Well, that and the vocals, since the Insomnium style has a tendency to feature incredibly talented growlers with destructively deep registers that would absolutely murder in more brutal styles, whereas this duo aims for a more ghoulish brittleness ala Kalmah's first three albums.The songs themselves here are, all told, fairly simple despite the average length falling a few seconds short of seven minutes, but they do a good job of not getting boring, exactly. It's sort of odd, because despite not being boring, they aren't quite engaging all the time either. There are a few highlights, sure, but "Euphoria" kicks off the album on a fairly humdrum note, and I don't think I've ever actually noticed the point where "Cravenness" gives way to "Oblivion". Despite that, the album tends to get better as it goes along and then starts wearing on you as it begins to wrap up, since there isn't a whole lot of variation between the tracks and the idea of mid-paced riffless melodeath with good melodies festooned in booming keys can only work for so long before you just start to tune it all out. So naturally, Ends of the Earth hits its stride between the second and fourth tracks before becoming a bit too samey to stay consistently engaged, despite a few standout moments in the back half in "Cravenness" and "The Grand Becoming". The title track is one of the few that truly does sound like Wintersun to me, with the heightened aggression calling to mind a more exciting version of Jari's least-bad-but-still-bad song, "Battle Against Time". "Mirrors" in particular really stands out for the truly astounding lead melody that never really stops careening around the track but never gets old either. I could probably listen to it forever.The problem is that, on my second spin through the album, that melody finally clicked in my head and I realized I have been listening to it forever. It is, almost note-for-note, the "chorus" melody in Joe Satriani's "Crushing Day". I never really talk about him because he's rarely relevant to what I typically write about, but I'm a big fan of Satch. Surfing with the Alien is one of the all time greatest guitar albums ever penned, and his penchant for ear catching melodies in between his signature shredding is exactly why Satch stands so far above most of his contemporaries to me. On one hand this means Euphoreon picked a damn good melody to nick, but on the other hand that marks two melodies (along with the aforementioned Be'lakor "homage" in the opener) that I fairly quickly noticed were borrowed with suspicious similarity. Obviously it could just be coincidence, but now every time I listen to this I'm doing so with heightened scrutiny, seeing if there's anything else I might've missed, and everything I don't immediately recognize is given something of a side-eye glance because now I can't help but wonder if some other, better artist already wrote it. Y'all better hope you don't get too popular now, because Uncle Joe has proven himself to be the litigious type if he feels he's been ripped off, just ask Coldplay how borrowing the melody to "Flying in a Blue Dream" worked out for them.Overall though it's not really the biggest deal, and it'd be massively hypocritical for a Gamma Ray fan like myself to write off a band for getting a bit too ballsy with riff/melody borrowing. Ends of the Earth is a quite solid melodeath album with a grandiose atmosphere. There's pretty much no chance it'll find itself on several year end best-of lists in 2018, but I certainly do like their approach and will surely keep listening to this as the year goes on. If this appeals to Wintersun fans I certainly would recommend Euphoreon to them, because the less people listening to Wintersun, the better.